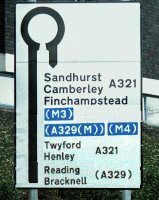 British road signs are generally well designed – they are legible from a good distance, and well sited so as to be visible in good time for drivers to make decisions. But away from the open road, things don't always work as intended. 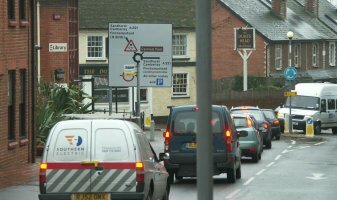 Limited space can compromise the siting of signs, and drivers in towns often have to make decisions at short notice, often while avoiding pedestrians and other obstacles. Drivers on any journey are pre-conditioned by what they are expecting, and of course by where they are trying to go. So even if they see a sign (which in a town they might not with all the distraction) they might still misinterpret it. That might just waste a bit of time, or it might lead to something more serious. If a large vehicle arrives at unintentionally at a place where the road ahead is too narrow or too low the driver has no alternative but to turn round. But there might not be enough space to do that safely and easily. HGV drivers rely on signs to warn them of obstacles like low bridges and width restrictions. The lorry above is reversing towards this fence, which for many years was regularly hit by lorries turning round in a tight space. These weren't isolated incidents. Several lorries a day were getting trapped and having to turn round because there is a width restriction a few yards past this point. The vast majority of drivers were skillful enough to turn without hitting anything. But over the months even a tiny minority added up to a lot of vehicles that hit the fence. Some times it was hit again before it had been repaired. (The picture shows the fence after a repair and before the next strike.) Over the years I (or the insurers of lorries 'caught in the act') spent a lot on repairs. So why did so many lorry drivers get into that spot? They obviously didn't intend to do it,since it wasted a lot of their time and caused a lot of hassle. We all make mistakes, but when so many different people make the same mistake so many times over a long period the individual driver is not the cause, but merely the trigger of a deeper problem with the overall system, which in this case consisted of the road network, the signs and the traffic, as well as the lorries and their drivers. Ergonomics is the discipline that enables us to understand how people interact with their environment, and how it can influence their behaviour. 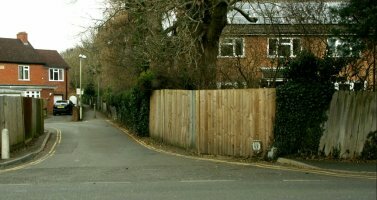 As the owner of the fence I had a strong interest in understanding why it kept being demolished, and as an ergonomist by profession, I also had the skills and knowledge to be able to look at the system to understand why it kept failing, and (I hoped) to be able to recommend how it could be improved. To help me understand how the drivers could have got things wrong, I walked along the routes they would have taken, looking at what they would have seen, especially the signs, which ought to have helped them find their way correctly. This gave me a clear idea of how they could have been misled. 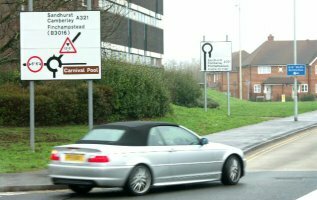 I then considered how relevant signs could be improved to reduce the risk of error, and presented my findings to the Council. 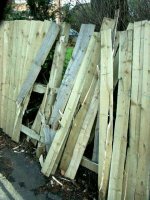 I did not get paid for any of this work – my motivation was to reduce the amount of damage to my fence. The first group of drivers and turned left just after they passed this sign on Denmark Street. Obviously they should not have done, so why did they? The street is narrow and can be quite busy. 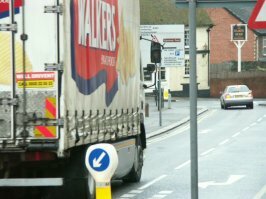 The lorry in this picture has just passed the entrance to one of the main car parks and is approaching the first junction. He doesn't have long to study the sign. When the brain is presented with a complex picture under pressure, it may breaks it into clumps that are easier to digest. In this case the layout suggests three clumps of text. 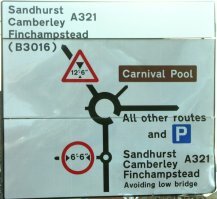 The text at the top lists three places beyond the low bridge, and the text at the bottom - next to the mini roundabout symbol - offers a route to the same places avoiding the low bridge. 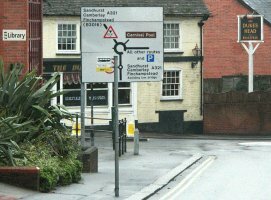 We know the drivers turned at the mini roundabout, but why would they ignore the width restriction, which is quite clear? Maybe the warning was obscured at the critical moment when the driver looked at the sign. This picture is looking roughly from the driver's position just after passing the car park entrance. Even if the warning was visible, the driver is presented with conflicting information, and has to make a split second decision. Could the sign be improved? I produced a mock that showed how the grouping could be improved to make it clearer that the the low bridge avoiding route is to the right at the main roundabout. 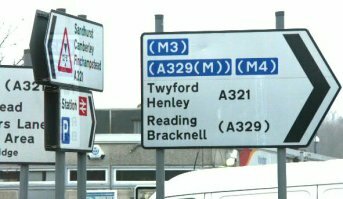 The Council's initial response was that the existing sign was perfectly adequate, however it was eventually replaced with a new one that used my design. The bus stop sign is still there though. The second group of drivers had correctly negotiated Denmark Street junction and gone on to deliver to the industrial estate south of the railway, but they then had a problem getting back to the motorway. Naturally they started by retracing the way they had come. After crossing the railway they should have taken a different route through the town to avoid the one way system, but instead they continued to retrace the way they had come. So let's look at where things go wrong. The information they need is on this sign, so why might they fail to see it? This road is quite narrow, with single file traffic threading between parked cars, so there can be plenty of distraction. The sign is set back in the forecourt of a pub, well above a distracting football sign at eye height. 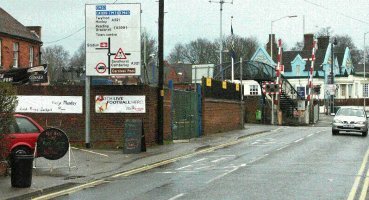 The critical junction is the other side of the level crossing, and it has more signs (enlarged on right) but those facing the driver don't mention the M4. This is it is viewed from a different direction. It would be just what the driver needs, except that he can't see it as he approaches the junction. The driver will remember that his inbound route was from the right, so in the absence of any information to the contrary he continues along the way he came. A quarter of a mile along Wellington Road he meets these signs, the first of which shows there is no way through for an HGV. The one behind offers an escape route for anyone trying to get south of the railway – but the doesn't want to do that – he has just come from. There's no one to ask, and he knows the motorway must be somewhere over to the left, because he came in that way. There isn't long to make a decision and he seems to have no option. Maybe there is a way through. The road to the left is narrow and he is faced with no through road ahead so he is forced to turn right. He can't even turn back because the mini roundabout is too small to go right round it. 300 yards later he meets the width restriction in front of our house. There were two points along the route where drivers failed to take the right action because they missed or misread the signs. Could the signs be improved? At the level crossing the obvious improvement would be to add an indication of the way to the motorway that can be seen when approaching the crossing. That could easily be done, as shown in this mock up. For any drivers who still go wrong here, they could still be helped by modifying the 'go round and return' sign that is already on Wellington Road to include the other destinations where that is the correct action, as shown in this mock up. 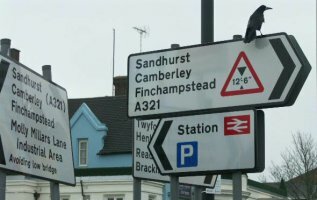 The Council reviewed all my evidence and ideas, and concluded that the signs were adequate for informing drivers of what they needed to know, despite the fact that the signs regularly failed to do so. 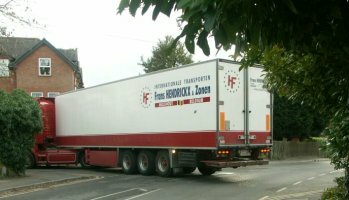 Maybe they assumed the drivers saw the signs and decided to ignore them just for fun – though being stuck in a tight spot with an HGV and impatient motorists on either side isn't my idea of fun. The third group of drivers had been told to take this route by someone with local knowledge. Typically the lorries were making local deliveries to places where this would have been a sensible route for a small van, and whoever gave the directions didn't think about the constraints on a large vehicle. In one case a coach driver had a passenger who insisted on going this way to the car park, despite the driver's misgivings. Obviously the passenger knew the route as a car driver or pedestrian, and had ignored the width restriction. In the later years, when SatNavs became more popular, they too mislead a few lorry drivers. 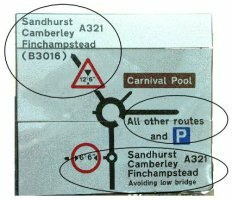 Cheaper versions intended for cars don't include information about width restrictions, unlike those intended for use by HGVs. 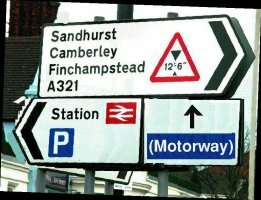 With the Council claiming the signs were adequate (despite the fact that they regularly failed to inform some drivers) nothing changed. The problem continued for over ten years. It wasn't quite as bad as it had been at its worst, probably because one of the signs had been changed, but several lorries a day still got stuck and had to turn round. 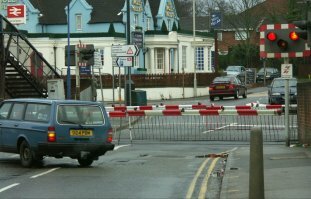 In the end, the problem went away when a new road was built near the station, and the road layout that came with it made right turns impossible.